Turn and Talk: Share your thoughts about the question below with a partner. Write your final response in your composition book. Next week you will be taking the NYS ELA for 8th Grade on Tuesday through Thursday. What are some of your biggest concerns or questions about the test? I can prepare for the NYS ELA exam for 8th Grade by the exam format and rubrics used to score the exam. Meet with your Syracuse appointment. Note: If you do not have an appointment, find another student who needs partner or join a pair to create a trio. Using the NYS ELA Packet, browse through the first passage (pages 1-15). You do not have to read the passage at this time. List four things you notice and four things you wonder about the sample test. Be prepared to share your thoughts. Meet with your Albany appointment. Using the Rubric Packet, browse through the 2-point rubric and the 4-point rubric. List 2 things you notice or wonder for each rubric in your composition notebook. Use the second passage, Brain Birds: Amazing Crows and Ravens. What are some ways Passage 1 is similar/different from Passage 2? Write your response on a half sheet of loose leaf paper to be turned in at the end oft he period. Browse through Passage 3. What are some ways this essay is different from the ones we examined in class today? Be prepared to share your response tomorrow in class. Add to your entry from yesterday for this activity. No need for a new entry. Read the essay question on page 41 (you don't have to read the sample response). 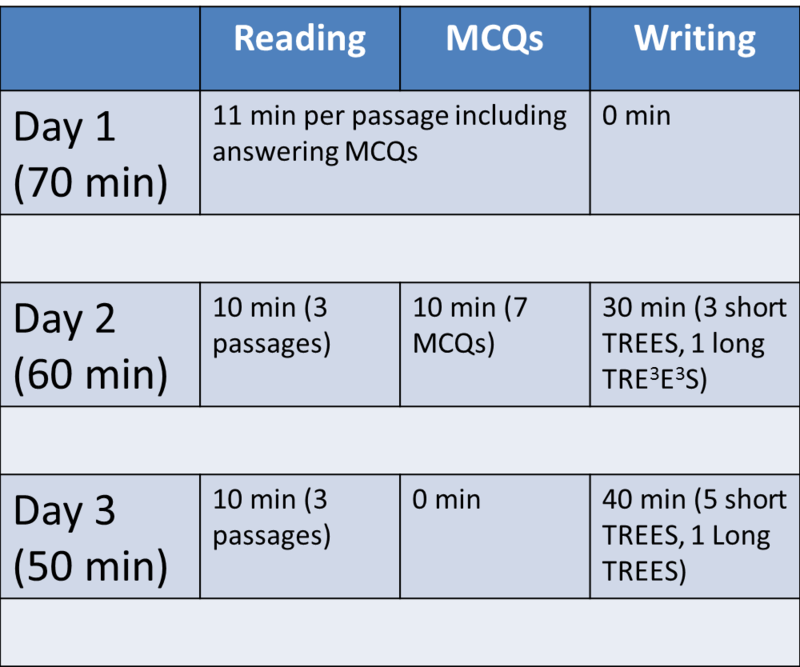 Which of the following TREES structures might you use to write your extended response? Explain your reasoning for the one you pick! I can estimate how long it takes me to read a passage and answer the corresponding questions so I can be sure to finish my test in the time given on the test. PACING: The amount of time you need to complete a test. do the easiest problems/questions first. leave a difficult question if it is taking too long. Figuring Out Your Reading Pace Using Passage 2! When timer goes off mark your spot. Repeat this process until you finish the passage. Use a similar process for pacing your writing. Respond to the Short Response for Passage 2 (page 37). Mr. DeGrandis will set a timer for five minutes. Fist to five: I am confident my pacing is on point! A marker to highlight and mark your sample ELA Test. Using symbols to mark a text to enhance reading comprehension. Highlight or Underline main ideas or important words and phrases. Write down thoughts that come to you as you read in the margins of the text. I can annotate a text as read it. What have we been doing all year that is similar to annotating a text? Modeling of how to annotate a text as you read using page one of Passage 2 of your ELA TEST. Read the first two paragraphs of page 2 (lines 28-40) to your partner while they annotate the text. Switch. Now you annotate your text while your partner reads the same section to you. Annotate the rest of the passage on your own. Complete your annotation of Passage 2 for a homework grade. I can use the testing skills I learned this week to complete a sample test of the NYS ELA. Complete Books 2 & 3 of your sample test. Mr. DeGrandis will monitor the time and keep you informed so you can judge your pacing. You will then work with a partner to score your response using the 2-point and 4-point rubrics. Complete Books 2 & 3 of the sample text. Peer assessment of your Sample Test based on the 2 and 4 point rubrics. What room are you in for the ELA? Finish your practice exam. You will have 20 minutes to finish. Use the rubrics to score the exam of a friend.